Fish are particularly high in omega-3 fatty acids that help protect against many diseases such as cancer, arthritis, high strokes, and heart disease. Regular consumption of fish can reduce the risk of various diseases and disorders.children who eat fish may be less likely to develop asthma and many other diseases. So try to include fish in your meals. After washing fish apply lemon juice, salt, and vinegar to it, refrigerate it for 2 hours. Sift flour, salt, and black pepper into a bowl, add milk and egg, whisk until just combined, set aside for 30 minutes. Dip the fish in batter and coat it in breadcrumbs, deep fry in batches in hot oil. Drain on paper towels. Peel and cut potatoes into chips. Soak in cold water for 30 minutes, then drain and pat dry. Deep fry the chips until golden. Drain on paper towels. Sprinkle the fish and chips with a little salt, to taste. 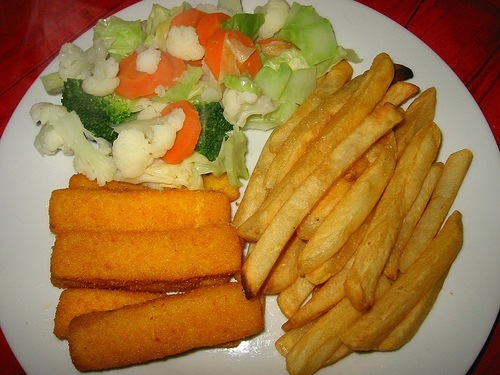 Arrange the finger fish and chips attractively on a platter and accompany with the bowl of chili sauce.